It wasn't just Bach's music that Felix Mendelssohn involved himself in performing, it was that of Handel too. 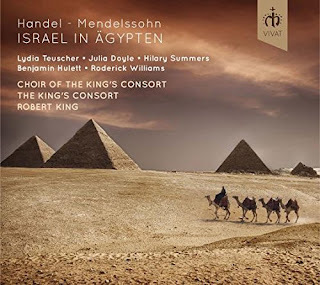 This new disc from Robert King and the King's Consort on the Vivat label sees them performing a reconstruction of the version of Handel's Israel in Egypt (Israel in Ägypten) which Mendelssohn conducted in Düsseldorf in 1833. On this disc, King and the King's Consort are joined by soloists Lydia Teuscher, Julia Doyle, Hilary Summers, Benjamin Hulett and Roderick Williams. Sung in German, with an overture by Mendelssohn to replace the one lacking in the standard version of Handel's score, Mendelssohn's changes are mainly related to providing more linking recitative, and orchestration of the organ part as the hall in Düsseldorf lacked an organ. The additional instruments are relatively discreet, two cellos and a double bass in the recitatives (a type of scoring used in Italy in lieu of a keyboard in recitatives in Rossini operas), and clarinets and flutes in the orchestral items. Some movements are missing, Mendelssohn was working with a short rehearsal time, and with amateurs. The biggest loss is the bass duet, 'The Lord is a man of war', but we do get the Alto-Bass duet 'Der Himmel ist Dein' from the Chandos Anthem, My Song shall be alway. Also, Mendelssohn's processes reveal his interest in historical accuracy. The extra instruments are no wholesale reorchestration but a discreet support. And having visited Buckingham Palace and got access to the library, Mendelssohn was excited to find the manuscripts there of Israel in Egypt included movements not available to him from the only published score, the Arnold edition of 1792. Part of the attraction of this recording is the light it sheds on Mendelssohn's proto-historically informed attitudes. When asked to edit a new vocal score he insisted his markings be distinguished from those of the composer. At performances where an organ was available, then no additional instruments were added. In an essay in the CD booklet, Robert King explains how he had to reconstruct the edition from fragmentary survivals, such as a single page of scored recitative. But enough survived to enable a convincing reconstruction. This was done initially for the 2014 Mendelssohn Festival at the Leipzig Gewandhaus. Not everything is completely authentic. King uses more modest forces than the choir of hundreds that Mendelssohn had available (and one wonders whether the Proms might be tempted to essay a wholesale reconstruction). The overture (a revised version of Mendelssohn's Trumpet Overture of 1726) introduces us to the sound world. Mellifluous and fluent, with a lovely balance between wind and strings and shapely turn of phrase. This continues into the Handel. The music might be Handel's but the details are Mendelssohn's, whether it be the extra wind parts providing new sonorities or the shaping of a phrase. Even when playing relatively straight Handel, the music has Mendelssohn's expression marks and dynamics, and this is respected by the performers who really do create an early 19th century feel and timbre. This is Handel made polite and mellifluous. The excellent chorus (numbering 36) brings out the real vividness of the word painting in Handel's choruses. The soloists are luxury casting, considering the amount they get to do in this work. Benjamin Hulett gets the bulk of the recitatives and he sings these with fine even tone and a nice expressivity. Roderick Williams gets the delightful frogs aria, and soprano Lydia Teuscher gets the aria Hope sothes our pains, and the two sopranos share the arias The enemy said and Thou didst blow. Alto Hilary Summers sing Though shalt bring them in, with Lydia Teuscher as Miriam in the final celebratory chorus. Inevitably this isn't a library version, but it sheds a great deal of light on the changing attitudes to Baroque music in the 19th century. And thanks to the fine performance from Robert King and the Kings Consort, it is far more than a curiosity.